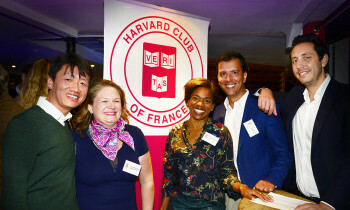 The Harvard Club of France is an all-volunteer organization. All of our activities rely on the dedication and energy of good willing alumni. This is why we always look for volunteers. It can be contribution to a specific event or more regular commitment. It does not matter. Volunteer work can take very different forms. Whatever the task, volunteers are always paired with a member of Executive Committee so that they get advise and guidance. Becoming a volunteer is also a good way to discover the Club, meet other alumni and perhaps join the Executive Committee later on. Provide back-office support from IT assistance to communication strategies for the Club. Coordinate events: from inspecting venues, to getting quotes from caterers, to welcoming the participants, to printing nametags, to purchasing gifts for the speaker, etc. Organize social events such as wine tasting evenings, speed networking events or mentoring initiatives. If you’d like to volunteer or, consider volunteering without yet knowing exactly how you could help, contact us. No matter what, we look forward to hearing from you!